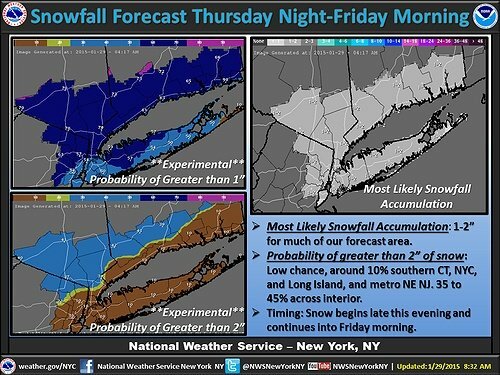 Right on the heels of Winter Storm Juno, Long Island's Blizzard of 2015, the National Weather Service is predicting additional snowfall of 1 - 2 inches for Long Island Thursday night into Friday morning. As of now, the NWS is reporting that both Nassau & Suffolk will likely see no more than two inches, with the chances of higher snowfall only 10% for the area. On Friday afternoon at 1 PM, a Gale Warning will go into effect for the Long Island Sound, as well as the South Shore from Jones Inlet Gardiners Bay due to the high winds of 34 to 47 knots. The Gale Warning will stay in effect until 6 AM Saturday morning, and boaters are advised to seek safe harbor prior to the warning going into effect unless they are highly experienced. Although no School Closings or Delays have been announced yet for Friday, be sure to check our Long Island School Closures Page for the latest updates on your local district closings. To get the latest traffic & road conditions before traveling, visit the LongIsland.com Traffic Center, and be sure to check out the live traffic feeds on our Traffic Cams Page. Photo via the NWS's Official Facebook Page. Outdoor Excitement, Weekend Events, News & More in May 18th's Newsletter! Resolution Round Up: Two Left Feet? 11 Dance Studios to Help You Get Your Groove On! Subject: LongIsland.com - Your Name sent you Article details of "Up to Two More Inches of Snow Expected for Long Island by Friday Morning"